2019 Best Crib Mattress. 3 Safe Infant Beds. Buying your child’s first mattress is an important decision and not one to take lightly. 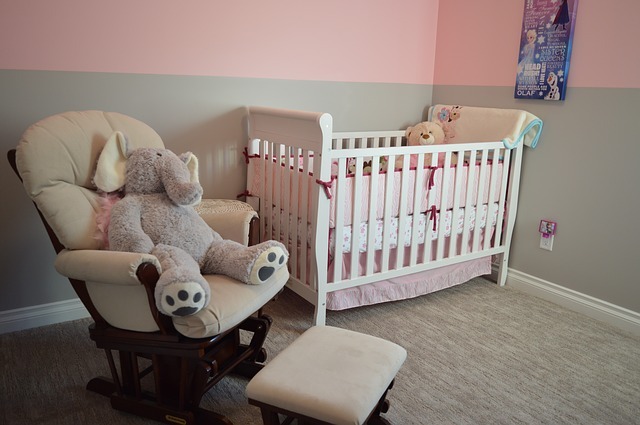 This is the bed that your little one will sleep on in their first months, and as they grow into the next stage of life. The comfortability of these beddings will also determine what your life will be like for the next few months of your baby's life. If the bedding is not comfortable for your child, you will surely have a hard time coping with all the crying and work you'll have to put in to calm down your child during the wee hours of the night. So, picking the right one is such a critical decision for your sanity also you don't have to buy just any product for your little one, if you're spending money on something, it might as well be something that is top-notch. You want to buy one that offers your child the most comfort and durability, but there are so many available. Online shopping gives you the ability to reach to all corners of the market, but it also gives you an endless number of options. This makes adequate research before buying a necessity. The only thing every parent knows for sure is not to buy a used mattress. This guide hopes to help with that. We have considered all the aspects parents think about when buying the best bed. We looked at materials, durability and comfort, as well as versatility, value and buyer rating. All these aspects ensure that your child is getting a bed that provides a good night’s sleep. There is more to making your new purchase than more people think. Before committing to buying, there are some questions that parents must consider. If you're planning on having children close together, you could invest in a more expensive, but longer-lasting model. Does it fit your crib? You’ll need to measure the inside of your crib, and any that you buy should be a snug fit. No parent wants the lack of comfort to be the only thing stopping their child from having a restful night’s sleep. Parents should consider the safety of their children when purchasing a bed. This relates both to the manufacture materials, and the child’s ability to roll over. During the buying process, considering questions and reviews like this will make it easier for you to narrow down the best crib models for you. You can never have too much information especially when it comes to buying a bed for your infant. Your child deserves only the best. The market is wider than it once was. Now, more parents are better informed about what is the best crib for their children. They don’t want just any bed, but rather one that can provide everything their child needs for a comfortable night of sleeping. It also is excellent for the parents not to have to worry about this kind of things, it is stressful to have to think about everything when you're raising a child. So, the fewer things to think about, the better. So, buying a top rated baby bed mattress right away will save you a ton of mental energy. It’s important to have a good bed as a baby and during the toddler stage. As well as comfort, the best crib should provide a level of safety, with quality features, at an affordable price. ​We've learned this through our extensive review of the best crib mattresses that we've found in today's market. Since children at such a young age tend to sleep more than half a day, you should definitely invest in a great crib mattress. This could prevent a lot of future problems for the child as well as help you have a better time caring for them. The Sealy Soybean Foam-Core is an affordable mattress model that suits both babies and toddlers. This high-quality model, made with soy-enhanced foam, offers comfort and peace of mind, as well as value. Parents will find that the Sealy Soybean Foam-Core is a decent middle-ground model in the mattress market. What we love most about it is that as well as providing all the necessities, the foam on the Sealy Soybean Foam-Core offers a comfortable night sleep. Comfortable Foam Core – The Sealy Soybean Foam-Core is made of a CertiPUR-US approved foam, which is noted for its durability and air quality, as well as for comfort. This mattress allows your child to enjoy a comfortable, uninterrupted sleep thanks to its durable soy-enhanced foam. Waterproof Surface – Like all good products, the Sealy Soybean Foam-Core offers a waterproof surface. However, unlike some poorer quality models, the Sealy Soybean Foam-Core also has waterproof binding. This ensures that spills can’t make their way in through the seams, and affect the mattress. Lifetime Warranty – The folks at Sealy are confident in the Sealy Soybean Foam-Core. So, they offer a lifetime warranty on workmanship and materials, to ensure that if anything goes wrong, you have someone to go to. 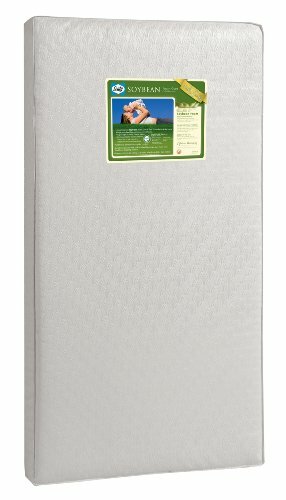 The Sealy Soybean Foam-Core is a great buy for parents that are concerned for the comfort of their children. The bedding offers good firmness, and quality materials that make it durable and long-lasting. And, it can also be used longer as its also known for being one of the best toddler mattresses there is today. One thing that buyers should note about this bed is that care needs to be taken with the sheets used. Due to the cover of the mattress, sheets that are too tight may result in the mattress compressing. 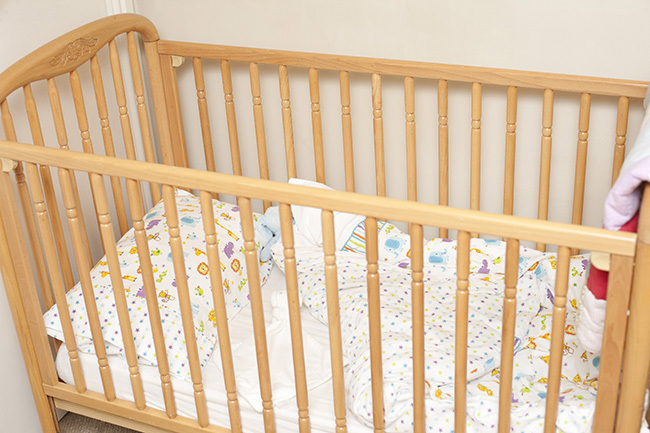 This shrinking leads to gaps in the crib, which impacts the overall safety. The Safety 1st Heavenly Dreams is one of the best-selling models available. It isn’t hard to see why. It is offering a good range of the expected, and necessary, features at a highly competitive price. What we love about this one is that it’s hypoallergenic. This means it’s able to provide a level of allergen safety for children. This is an important feature as parents do not want to be exposing their children to harmful materials at such a young age. Costing under $60, the Safety 1st Heavenly Dreams is an absolute bargain. This is especially when you consider the materials and durability of one of this type. High Density Thermo-Bonded Core – The Safety 1st Heavenly Dreams is made of a high density thermo-bonded core. This is a kind of foam that offers a firm surface to keep your baby safe while they sleep. It is made of about five-inches of this specially manufactured foam, and meets all fire safety standards. ​Water Resistant Vinyl Cover – The Safety 1st Heavenly Dreams also offers a vinyl cover, which protects the foam core. The cover, being vinyl, is water resistant, and offers some stain resistance as well. It is easy to clean and maintain. ​Lightweight – It is going to have the sheets changed regularly, as well as be picked up, and aired out. So, it helps that the Safety 1st Heavenly Dreams is light at less than seven pounds. This means that any parents can easily pick up and move it as required. The main thing to remember with the Safety 1st Heavenly Dreams is that it’s a cheap model. This budget price means that consumers cannot expect this one to last for decades, and with many children. Nor should they expect the higher levels of material quality that other, more expensive brands can boast. 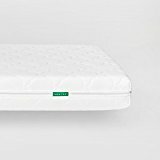 One issue that buyers have with the Safety 1st Heavenly Dreams is that it isn’t as durable as some other models, and after extended use is not as firm. This isn’t surprising considering the price. Essentially, it means that this is a bed that is suitable for younger, lighter children more so than toddlers. So, is it the "best infant mattress"? Let's go in and find out if it is. This Newton Crib Mattress model is all the rage on the parenting market right now. It’s won a whole host of design awards and has been featured on network news and lifestyle sections of major newspapers. We’re very impressed by the breathable design, which makes sure your child can breathe in absolutely any position. Parents with babies who were natural face-sleepers said this crib model gave them absolute peace of mind since it’s so well-ventilated. It’s Green Guard certified, completely non-toxic, and very eco-friendly! This one’s a shoe-in for the top quality pick! It’s very widely-acclaimed. This Newton bed won the JPMA Innovation Award in 2015 when it was released. It’s also been featured in the New York Times, ABC News, Bump, Bundoo, and lots of other parenting publications. All of the reviewers complimented the innovative design and superb construction materials. It certainly is one of the best affordable cribs available to us parents. There is no doubting that now. So, what’s so impressive about the design? It’s high, almost entirely breathable. The mattress itself is incredibly porous, which means you can breathe through it! So, even if your baby turns over in the night, your little one won’t have any risk of suffocation. The added breathability also helps this one stay cool. That’s because 90% of the structure is air. We’re not sure how they’ve managed that feat, but they have! The other 10% is a non-toxic, food-grade polymer. Parents who bought this one were extremely impressed. Many wrote that they were skeptical at first, and decided to try it out for themselves when the mattress arrived in the mail. They were astonished to find that they could breathe perfectly easily, which meant that baby would have no problem. That extraordinary breathability makes this an extremely safe sleeping solution for little ones who roll over at night or like to sleep on their stomach. You’ll rest easy knowing that no matter how they move, they’ll be able to breathe freely. That’s a lot of peace of mind for parents who have previously had to be on constant sleep patrol with their newborns. This best-rated crib mattress is guaranteed to impress you but also make your life so much easier that your infant is always sleeping better at night. Better sleep for your child means better sleep for you as well. It’s completely washable. You don’t have to worry about any bacteria making home in this bed. This one also comes with a water-resistant cover which prevents any accidents from affecting the cushion itself. If something does get through the cover, you can clean the mattress itself easily. It’s relatively affordable. While this isn’t the cheapest option out there, it’s priced comparably to other quality crib models. Plus, we think you get much more value for money. But if you have the money to spare, this is actually a very good option. 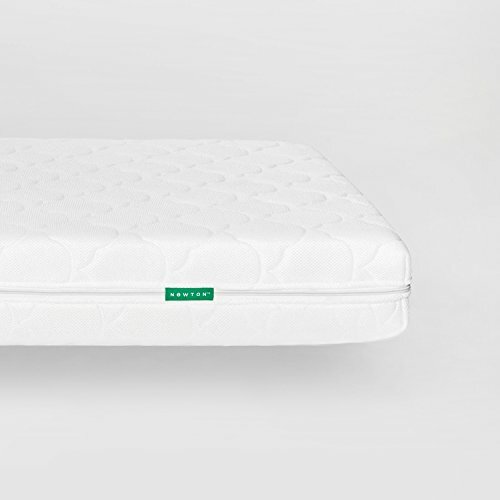 This model does indeed belong in our exclusive list of "top crib mattresses" if you are taking the price out of the conversation. But other than that, it is a very good purchase for any new parent. The Newton Crib Mattress company have excellent customer service, and promptly replied to any customer concerns-even in buyer reviews. They also offer a very impressive 100-day trial, so you can test this with your baby. Surely is the top baby mattress of its generation. Not that many other brands and companies can match up with this beautiful and affordable model. It’s very eco-friendly. This model doesn’t have any foam or latex in it, and it’s free of springs, glue, and chemical allergens. It’s Green Guard certified, so you can be sure there’s nothing toxic at any level. It’s also completely recyclable when your child is done with it. Parents really loved knowing that there weren’t any chemicals in this model, especially compared to other models which off-gas or have chemical odors that can be harmful to baby. The Newton Crib Mattress softer than other eco-models, but still provides plenty of support to make sure your child isn’t sinking into the bed. It’s built for superior resilience, so you can keep using it without having to flip it over. That saves a lot of time and energy, plus who honestly likes doing those kind of things? Am I right? Overall, parents who bought this had extremely warm praise for the quality of the design and construction. They reported great sleeps for their child, and better peace of mind for themselves. Buyers overwhelmingly said that it was well worth the high price tag, and one of the best purchases they had ever made. Some parents said this one felt a little too firm for children switching from a traditional mattress. It’s meant to feel more bouncy than cushy, to prevent little ones from sinking in (which can cause sweaty backs and other concerns). It’s fairly pricey. While this certainly isn’t the most expensive option on the market, it’s in the top part of the range. This guide has looked at three different kinds of crib mattresses, and their suitability for babies and toddlers. Of course, each bed has its own selling points, and buyers should consider their own needs before purchasing. Parents looking for versatility in their bedding model should consider the Simmons Kids Beautyrest crib mattress. The cushion offers features for both babies and toddlers with its 2’n’1 design and is consistently considered the most flexible model for extended use. Along with those key features, the Simmons Kids Beautyrest crib mattress offers an affordable price, within each of most buyers. The Simmons is 100% one of the best if not the best top rated crib mattress that we have available today. That says a lot about this product. Those looking for the most budget-friendly mattress, that also happens to be a best selling item, should consider the Safety 1st Heavenly Dreams crib mattress. Costing well under $100 the Safety 1st Heavenly Dreams offers parents comfort and convenience without breaking the bank. The product is popular with buyers, and is definitely a smart choice. Its name alone is synonymous to safety. So it could very well be the safest crib mattress that the brand has released in the past year. You really can't go wrong with this company's products. If what you’re after is peace of mind gained from purchasing a continually top-rated model the Sealy Soybean Foam-Core crib mattress is a perfect choice. Affordable, comfortable and with your child’s safety in mind, the Sealy Soybean Foam-Core has been rated by buyers as one of the best on the market. It represents a well-rounded choice, supported by many opinions. If you feel like none of these options suit your child or your family, there are always other top-rated options. You can continue your search by looking around our site at the other products available. We are proud to offer a range of information on beds and cushions at uponamattress.com/best-reviews, and hope to help you in making your decision.